ExecutiveBiz talked with Roger Karner, president of U.S. market, about his company’s recent name change, suite of lighting products for federal customers and where he sees Signify driving the most value in 2018. ExecutiveBiz: Philips Lighting recently changed its name to Signify. Tell us more about that. Roger Karner: As the world leader in lighting, we’ve led the lighting industry with innovations that serve both the public and private sectors for more than 127 years. To maintain that position, we must adapt to the challenges and opportunities that come from an increasingly digital world. While we will continue to use the trusted Philips brand for our products, our new company name – Signify – originates from the fact that light becomes an intelligent language, which connects and conveys meaning. It celebrates who we are today and highlights our ambitions for the future in terms of innovation and sustainability. It is also a clear expression of our strategic vision and purpose to unlock the extraordinary potential of light for brighter lives and a better world. ExecutiveBiz: Can you highlight where the company participates in the government contracting marketplace? Roger Karner: We are proud to be a Department of Energy-qualified energy services company as well as a prime contract holder for a General Services Administration Federal Supply Schedule 84. We are able to provide a simple and streamlined way for our federal customers to procure a wide range of effective lighting solutions. Under this contract, we are actively pursuing Energy Savings Performance Contracts (ESPC) ENABLE lighting projects, which focus on targeted energy conservation measures. We are also among a select group of companies that can work directly with a federal customer on financing potential projects when appropriate funds might not be available. ExecutiveBiz: Can you discuss some of your more significant wins in providing solutions to federal agencies? Roger Karner: Last March, we completed a lighting upgrade for the DOE headquarters at the James Forrestal Building in Washington, D.C. The team upgraded the building from traditional fluorescent lighting to energy-efficient, high-quality Philips InstantFit LED lamps, which cut energy consumption by approximately 45 percent. The project also improved the overall lighting lifespan and uniformity of the equipment, which will help reduce ongoing maintenance costs. Because of the compatibility and ease of installation, we were able to minimize labor costs and limit disruptions during the retrofit process. We’re also working with the GSA as part of the Green Proving Ground program that evaluates innovative sustainable building technologies. In their own facilities, the GSA is testing Philips SpaceWise technology, which is designed for large, open-plan office spaces, and integrates intelligence and dimming controls tuned to specific application needs in the LED luminaire. With presence detection and daylight harvesting, each fixture can act independently, or as part of a mesh network – all without the need for re-wiring or additional building controls. The GSA will improve performance and save 50-to-75 percent more energy versus traditional lighting technologies. ExecutiveBiz: As you look at your portfolio of products and services within the federal market, where do you see the greatest opportunities for Signify in 2018? Roger Karner: The most immediate opportunity is the increasing demand for more efficient light. Lighting accounts for 10 percent of total electricity consumption in the U.S. The federal government has one of the largest office footprints in the world, so needless to say, it’s a huge opportunity to drive resiliency and energy efficiency in federal spaces. The other opportunity is the continuing growth and adoption of lighting systems and services that take advantage of the promise and potential of digital light. These lighting system become a path to exciting new services, enabled by data, that can provide tremendous value from reducing energy and operating costs to enhancing productivity and resiliency. To realize the potential of connected lighting systems, we have made data privacy and security our top priorities. Privacy and security are essential elements of our product development process and fundamental to being a responsible innovator. 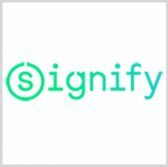 ExecutiveBiz: What new products and services are on the horizon for Signify? Roger Karner: We are always working to better serve our federal customers with a commitment to quality lighting experiences, greater energy savings and better data-enabled systems. We are setting the pace in the lighting industry toward connectivity. Our recently announced Internet-of-Things platform, InterAct, is designed to help federal customers harness the IoT and deliver data-driven insights on energy, resilience and space unitization for federal buildings, resulting in up to 80 percent energy savings. We also see a lot of potential for our tunable white lighting offerings, which allow federal workers in office buildings to control the color temperature of the lights, improving employee comfort, productivity and well-being. Lastly, we are pioneering new models like Lighting-as-a-Service (LaaS), in which federal contractors can simply pay for the light they use. Our team owns, manages and maintains the actual equipment, which helps federal customers keep costs down and improve resiliency when deploying some of the latest technologies. ExecutiveBiz: Are there any new technologies that Signify is watching that could enhance your government solutions offerings? 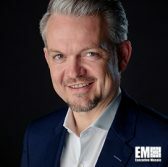 Roger Karner: For government facilities where heightened data security is an utmost concern, our Light Fidelity (LiFi) systems offer a new way to connect wirelessly by using LED light to transmit data. By plugging into a LiFi internet zone, users can access and transfer data instantly by using a simple personal USB access key. LiFi can also be easily deployed in places where radio frequencies may interfere with equipment and LiFi technology adds an extra layer of safety since light cannot pass through solid walls, and a line-of-sight to the light is needed to access the network. The LiFi zone is completely secured within the pool of light created by the LED luminaire. Before joining Philips Lighting in 2012, Roger Karner was the chief executive officer of Schneider Electric. Executive Spotlight: Interview With Diane Gongaware, VP of U.S. Public Sector Services at Cisco Systems, Inc.
Executive Spotlight: Interview with Helene Fisher, President of Mission Services and Solutions, DLH Corp.